It’s (nearly) everything you asked for, after all these years. For the first time ever, EA has delivered a tournament title as a downloadable expansion pack. In prior years, you’d see a disc-based game drop for the European Cup or for the World Cup in each respective year. With the Euro 2012 DLC add-on, EA is implementing the content you’d see in one of these limited tie-ins grafted onto FIFA 12. While there are some elements that feel missing, it’s a solid deal for less than half of the cost of what EA normally charged for these games. In other words, this is – at its most literal – exactly what we asked of EA for years. 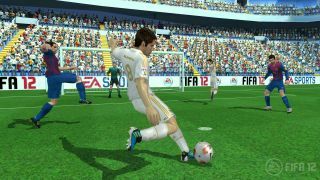 Feature-wise, you’ll jump into the Euro expansion within FIFA 12’s menu. Upon diving in, you’ll be greeted with a themed interface and all of the fanfare you can likely expect on television come early June. The Euro 2012 expansion touts the other standard features of a tournament title. There’s the tournament itself, which you can play through online or offline, with any of the UEFA nations. In lieu of the Captain Your Country mode that was the norm for past tournament titles, Expedition Mode is the newest feature. In this mode, you create a fictional national team. From there, you either import your Virtual Pro or pick a real life player to lead a group of unknowns up the ranks. As you beat smaller countries repeatedly, you’ll get the choice of taking some of their best players and adding them to your fictional nation. It feels like the best of Ultimate Team wedded to the traditional tie-in mode, all with a funky presentation that wouldn’t feel out of place in some German-developed RTS game on PC. It’s fun to build up your fictional nation and conquer others, and it’s a mode with enough legs to get you through the gap from the Champions League final to the kick-off of the genuine article. The expansion not only updates the HUD, it also looks even more detailed compared to FIFA 12. Player likenesses seem to have a slight bit more clarity than in the core game, and the uniforms have more sheen. We noticed a few new subtle animation tweaks, and now players seem to tussle a little more (you may seen an errant elbow from time to time, too), and their collisions feel even rougher than in the normal game. In that sense, it’s a remarkable improvement, and while we don’t know for sure that some of this content is a teaser for FIFA 13, we wouldn’t be surprised to find out down the line that it is. Having said that, the default camera isn’t quite where we’d like it, and even with some tweaks to the angles, it’s not quite where we liked it in the core game. We finally sighed and adjusted to the odd angle, which made rethink some of our runs down the wings. There are some elements of the tournament games that we miss, such as some of the Story of Qualifying feature, in which you had a variety of real-life challenges, instead of the content that’s got an expiration date linked to it, as seen in FIFA 12. In that sense, there’s a piece of the licensed disc-based games that are missing, but they’re minor in comparison to the rest of the package. That said, the expiration-based challenges still contribute to the EA Sports Football Club standings. Overall, if you’ve sunk countless hours into FIFA 12’s numerous modes, and you’re one of the millions of fans who’ve dropped big bank on those tournament games that are only good for two months or so (the lead-in to the tournament and the time that it’s happening in real life), this is a no-brainer. It’s less expensive than the disc-based games and provides plenty of new content (though, we suppose, fewer achievements and trophies, if you obsess over that) to dive into. If, however, you’re the kind of FIFA player who normally eschews the tournament titles, and you're much more interested in the club game than an international tournament, then there’s little that the pack will offer to sway you. With that out of the way, we hope that this marks the death of the disc-based tournament game. An add-on pack like this one more than contributes to the overall experience and keeps us engaged in our game, long after the final Live Season stats have kicked in. FIFA 12 is a fine base upon which to build, and this DLC excels. This downloadable content was reviewed using both the Xbox 360 and PlayStation 3 versions.